Bringing home a new puppy is very exciting. You’ve likely chosen a puppy but have to wait weeks before he or she is old enough to come home to you. The bad news is that the wait can be difficult and feel like forever. The good news is waiting gives you a lot of time to think and prepare to bring your new furry family member home. 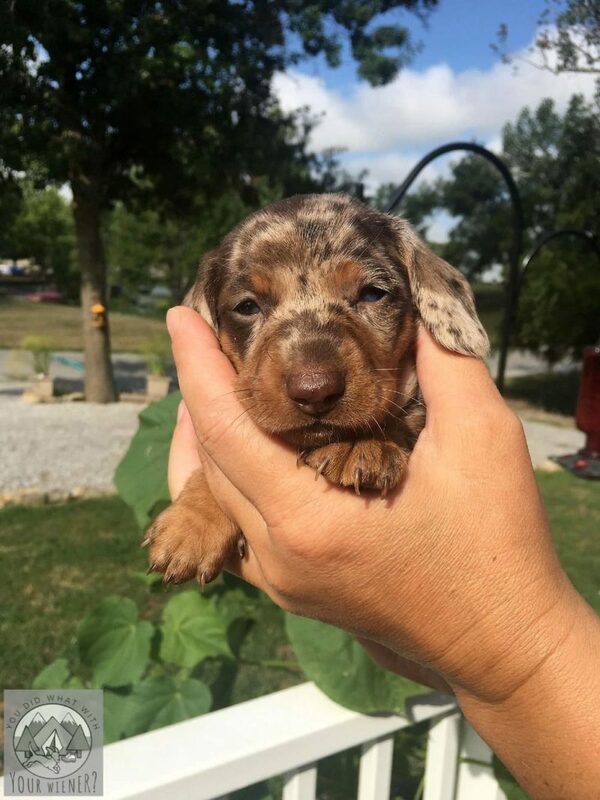 When I was waiting for my new Dachshund puppy to come home, I read a lot of articles on how to prepare for when my new puppy arrived. I thought I was totally prepared. I most definitely was not! While I may have been more prepared than some, there were definitely things I didn’t read or think about. I learned a lot by trial and error. Below are my tips for adjusting to life with your new puppy and making the most of the first few weeks. Note: some of the links below are affiliate links which means that we get a few pennies if you make a purchase, at no extra cost to you, to help support this blog (and we really, really appreciate it!). Also, I may have, or have had, a working relationship with some of the brands/products I recommend. I only work with companies and product I truly love though. The first few days after your new puppy comes home are a blur. You’re excited, might be a bit frustrated at times, and probably won’t have time to focus on much else. Your sleep may be severely interrupted, leaving you too tired to do much or not thinking straight (“puppy brain” is real). It may be difficult to leave your puppy alone if they are experiencing anxiety due to leaving their siblings and being in unfamiliar surroundings. Focusing on bonding with your puppy, and getting to know their personality, might take more time and energy than you thought. No matter what the reason, the first few days with your puppy will be all-consuming. I suggest clearing your calendar of obligations for the first 3-5 days after you bring your puppy home. It’s even better if you can take a few days off work. Puppies are super inquisitive and often explore their world with their mouth and teeth. They’re also almost always on the move when they’re not sleeping. Because you have to constantly keep an eye on them, it can be hard to get anything done. Even showering can be a challenge if no one else is home to watch them. Ultimately, your puppy would be crate trained but they likely won’t be comfortable alone in a small enclosed space for a couple of months. In the meantime, the best thing to do is limit their access while still giving them a sense of not being closed in by using a gate or pen. Doing this can allow you to take your eyes off your puppy for a minute and will start teaching them how to tolerate being physically separated from you, which is a great precursor to crate training. I use the step-through doorway dog gate from Carlson Pet Products between the kitchen and the rest of the house. When I’m not in there cooking, the kitchen is actually a really safe place for my puppy to be. The only thing touching the floor is appliances, I have puppy-proofed the cabinets that have food or cleaners in them (using child safety latches), and it’s linoleum so any messes are easy to clean up. When I am cooking or boiling water for tea, I can close the gate to keep my puppy safely out of the kitchen. I also have a couple of free-standing dog gates that I can use to block of my puppy’s access to just one room. 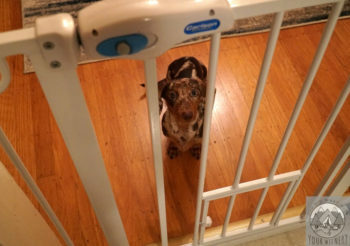 When I need my puppy to “stay in one spot”, but it’s not feasible to block off rooms in the house (like when I am visiting a friend’s house), I use a portable dog pen. Sometimes it’s not necessary or feasible to constrain your puppy. Sometimes you can give them an irresistible treat or toy and know it will keep them occupied and focused on something safe for 5-10 minutes. 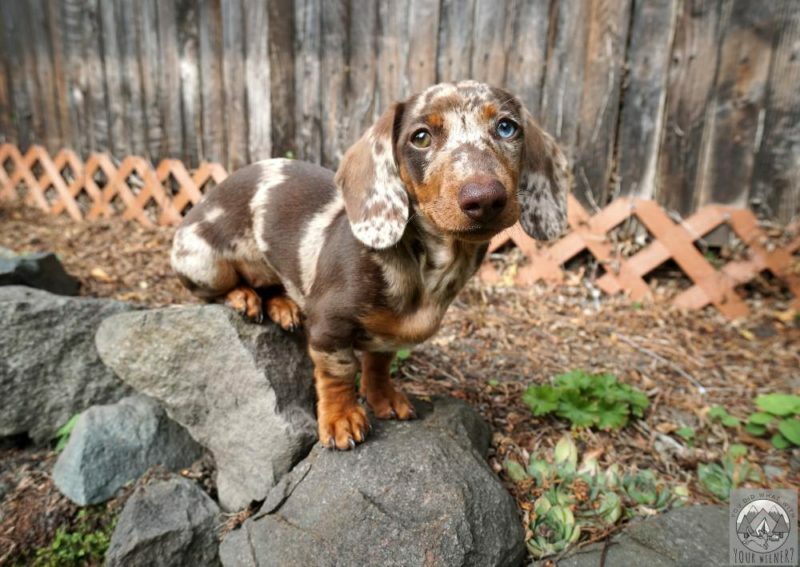 Your puppy is still in the exploring stage so it’s best to have a few different things on hand so you can switch up so they don’t get bored of the same thing over and over. Remember, if you have multiple dogs, and there is food involved, there could be a skirmish between them over food. While the point of using these distraction tools is so that you can shift your main focus for something else for the moment, you should pop in and check on your dog’s the first few times until you are sure there are no food guarding or aggression issues. To be safe, these might best be used in conjunction with the gates above. When you bring your new puppy home, they may or may not be trained to go on a potty pad indoors. If they are, you’ll need to decide if you want them to continue to use a potty pad. If they aren’t, you need to decide whether you want to train them to go inside on a potty pad or just skip that step and immediately learn to go outside. There is a strong case for never using potty pads because it can lead to potty accidents in the house down the road. Can you take your puppy out every 30-90 minutes though? Most people can’t unless they work from home or don’t work. Can someone come let your puppy out regularly? 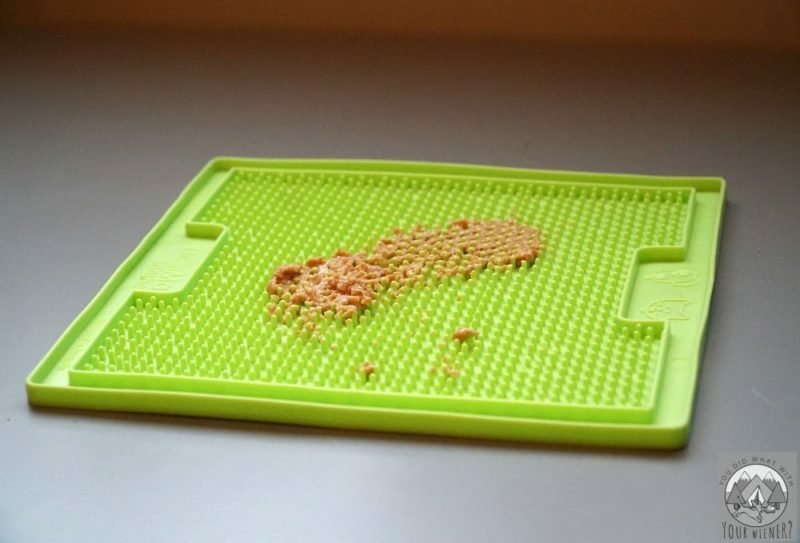 In many cases, the use of puppy pads may be mandatory. The point is to think about this and have a strategy before your puppy comes home. When you bring a puppy home, they’ve generally been able to “be themselves” with their siblings and parent dogs. During the first few weeks of their life, the focus is usually just learning about the world around them and learning how to interact with other dogs. Their training and human contact is limited. Basically, in my eyes, a puppy is a wild animal that has to be domesticated and learn to live with people when you bring him or her home. Your job is to teach your puppy about how to interact with humans and the world around it. 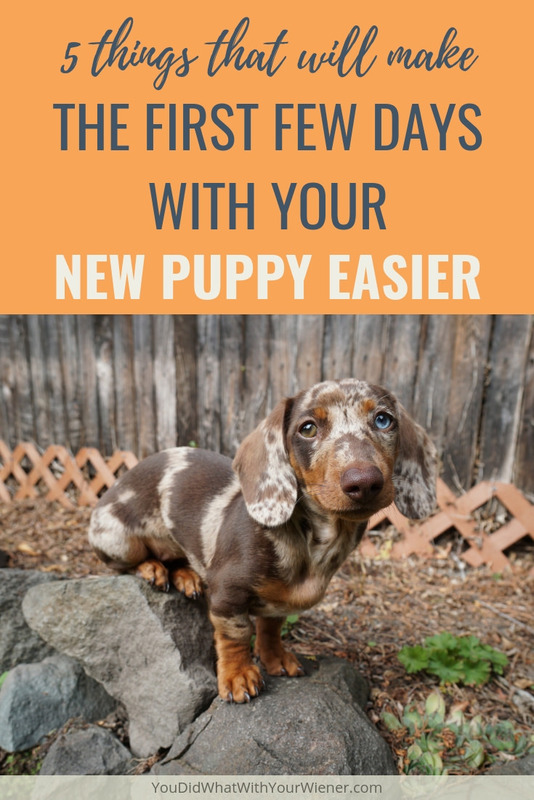 While puppies go through development stages like children where they aren’t capable of learning all of the things right off the bat, there are a few things you should start with right away. Beginning to train your new puppy right away can help make sure they grow up to be a well-behaved, and well-adjusted, dog. This includes exposure to different dogs, people, and experiences. Sign up for puppy “Play & Train” classes to start right after they get home so they can play with other dogs in a safe, controlled environment. Feed your puppy by hand to start bonding (it’s best to do this with all adults and older children in the family). 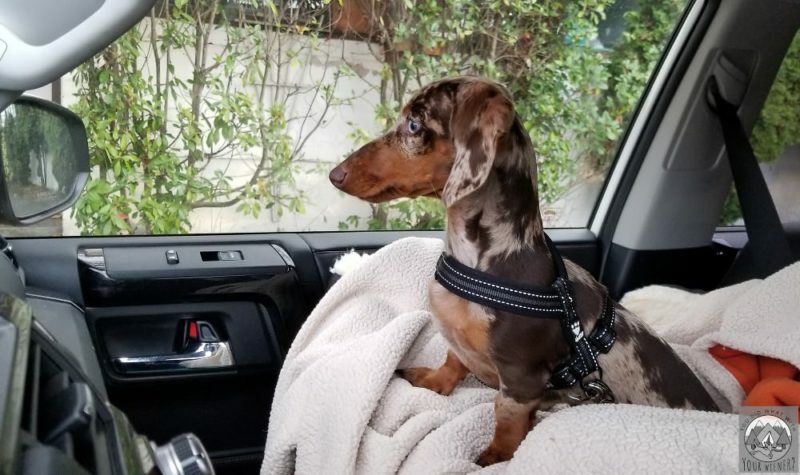 Take your puppy for rides in the car so they get used to being in motion and you can find out if they are a dog that is prone to getting car sick. Walk your puppy, or carry them if they haven’t had all their shots yet, outside of the home so they can experience different smells and sounds. Practice getting your puppy to walk on different surfaces like carpet, wood floors, metal (a baking sheet works for this), and metal grates. Their name – Practice sitting by, or standing near, your puppy and saying their name. Praise them and reward them with a treat every time they turn their head to look at you. Sit – This is a precursor to all other training (like down and stay). This is a pretty easy command to teach after watching a quick how-to video online. Stop biting – This one will save your fingers and help your puppy learn how to interact appropriately with humans. Check out this video to learn how. 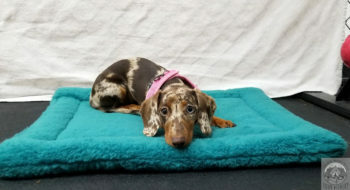 To be comfortable in a dog crate – I mentioned above that it can take months to properly crate train your new puppy but this can and should be started right away. Be sure to sign up for a puppy class before your puppy comes home to start soon after they get there. Being prepared for life with your new puppy is the key to a joyful experience for both of you. I hope my tips help.